That’s right, NYC. 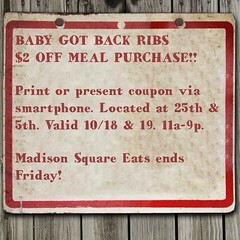 We’ll be dishin’ up our delicious ribs 7 days a week in Madison Square Park! Come see us September 21st – October 19th, 11am – 9pm every day. Be sure to check out our ‘Special Offers’ section to take full advantage of our social media deals and discounts. 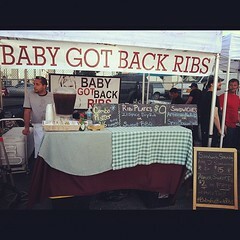 We have some fun things planned for this month-long event, so come grab some ribs and get ready for a good time. We will still be participating in the Smorgasburg events in Brooklyn through November 17th – Saturdays in Williamsburg at the East River Waterfront location and Sundays in Dumbo at the Brooklyn Bridge Park location, 11am – 6pm. 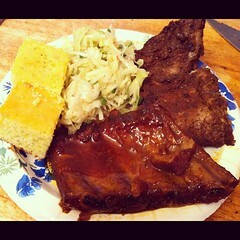 Grab your friends, put your smiles on, and come enjoy some mouth-watering ribs! We’ll see you soon!! « See You At The Vendy Awards!